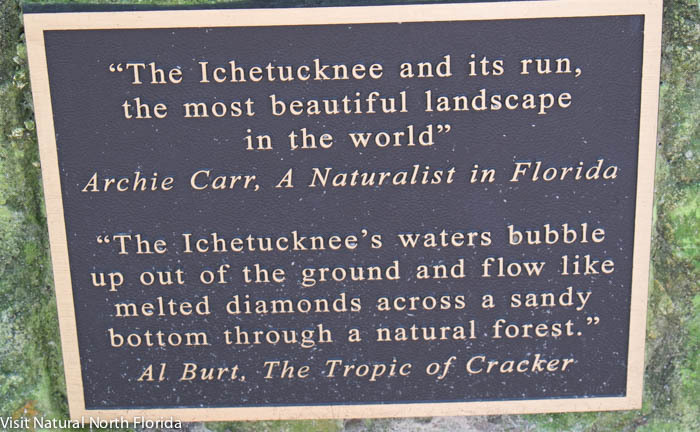 The Ichetucknee River and springs put Fort White on the map, so to speak. Originally settled near “Fort White”, a military post built in the 19th century at the time of the Seminole Wars, this Columbia County town is truly a gateway to one of Florida’s most beautiful state parks. Ichetucknee Springs State Park stretches about 4 miles alongside the river, from its spring-fed headwaters and hardwood forests to US27. Beyond US27, the river flows another few miles, through largely residential areas, to its confluence with the Santa Fe River. 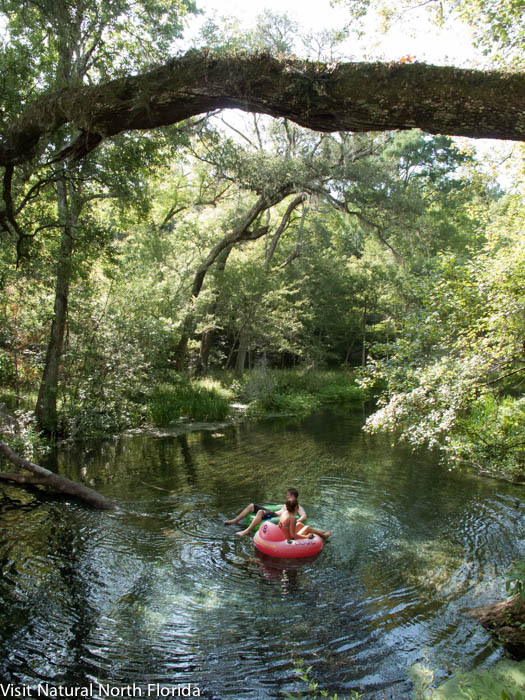 Most visitors to the state park, springs and river drive from the east, from towns like High Springs and Alachua. The “Itch” is also a favorite for college students, who raft and tube the clear, cold (72-degree F) river, many coming from nearby Gainesville. But Fort White is a good place to stop at a local cafe or convenience store to pick up picnic supplies, cold drinks (FYI–no alcohol, plastic or glass containers are allowed in the park or on the river! ), fuel or snacks. It’s an easy bike ride from Fort White to the park! Tube rentals and shuttles are available from local outfitters as well as from the concessionaire within the park. Kayak trips can be arranged from outfitters in High Springs (Adventure Outfitters, Rum 138 Outfitters, Canoe Outpost) Ichetucknee Family Outfitters offers rentals as well as lodging. There are a few bed and breakfast/AirBnB lodging opportunities in the area. Here’s the link to a convenient AirBnB that’s near the State Park. Scuba diving is permitted in one area of the park– the Blue Hole (you MUST be Cave Certified). As this is one of the area’s most popular parks, it can also be crowded. If maximum occupancy is reached, usually mid-day, entry may be denied by the park’s staff. So…our advice is to get there early, on a week day! The South Take-Out gate is closed to traffic during peak visitation times and during the summer months (Memorial Day to Labor Day). It is accessible from the river for tubers/paddlers- use the Concession Tram service or hiking trail to get to the South Entrance Parking Lot. During the summer months (Memorial Day to Labor Day) you may experience longer than usual wait times to enter the park.